Last week, I wrote that Wine Spectator was wrong in giving a 99-point rating to the 2007 vintage of Napa Cabernets. Yesterday Wine Spectator Executive Editor Thomas Matthews posted a response to my post in the comments. I'm afraid most people won't see it, and his points are interesting, and besides, I'm kind of an old-school guy when it comes to giving people a chance to respond when I've written something negative about them. So I'm reposting his comment below, verbatim except for a few asterisks, which denote points I will disagree with afterward. And I have one very large question that Matthews didn't answer, but I hope he'll come back to this post and do so. "Rating a vintage is not an easy task, as any honest critic will acknowledge. Making a blanket judgment on the basis of sampling a few wines, even a few dozen wines, on a single occasion is, in my opinion, an act of hubris. At Wine Spectator, we look at the growing season, to estimate potential*; interview winemakers, to gain perspective; survey the results of our own blind tastings of hundreds of wines from the vintage; and finally, make a judgment. Our goal is to give consumers a general guide to the style and quality of a given vintage in comparison to others. Clearly, James Laube, who rated the 2007 vintage for Napa Cabernets, prefers the ripe, structured, balanced** wines that come from warm growing seasons. That's why he rates 2007 higher than, say, 1998. Critics with different criteria will come to different results, and fairly so. As with specific wines, it's all a matter of taste. I think you leave an erroneous impression, though: you imply that Laube disliked 2006 and 2008. That's far from true: he gave '06 Napa Cabs a vintage rating of 95 points, also "classic," and '08 a preliminary score of 90-92, "outstanding." "If 2007's stellar quality is not enough to whet your appetite, vintners are just as revved up about what lies ahead. Many winemakers insist that as grand as their 2007 wines are, 2008 will be superior. There's yet another wave of winemakers who suggest that the 2009 wines, still in barrel, may even trump the others. "Though the focus of this report is 2007, the 2006 vintage should not be overlooked. Many exceptional wines were made in '06, some of which have only now been released." 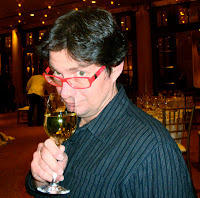 We appreciate you bringing attention to Wine Spectator in your blog. By the way, I have received at least a half-dozen letters from Matthews over the course of my career complaining about things I've written. This is easily the nicest; I'm not sure what that means, but I like you too, Thomas, really I do. * "We look at the growing season, to estimate potential" -- This is usually important in France, where there's a real chance that grapes in many regions will not get ripe enough to make good wine. It's much less important in California, where sufficient ripening isn't the issue. And in fact, I wonder if California isn't actually the reverse of France; that only seasons that are unusually cool lead to a plethora of truly great wines. ** "James Laube, who rated the 2007 vintage for Napa Cabernets, prefers the ripe, structured, balanced wines that come from warm growing seasons." -- Laube is entitled to his personal taste. But it's factually incorrect to state that "ripe, structured, balanced wines" result from warm weather in California. The issue this state's wineries face is not lack of ripeness, but lack of balance, and warmer growing seasons here can make that worse, not better. In fact, if you look at wine the world over, it's simply not true that warm growing seasons automatically lead to balanced wines. You might get more balanced wines from a warm year in the Mosel, but not in Barossa Valley. Napa Valley is closer in character to the latter. What does a 99-point vintage mean? It seems so impressive: nearly perfect! But does it mean nearly all '07s will be better than the '06s or '08s from the same vineyards? Does it mean the great wines will be greater than ever? Does it mean cheap Napa Cabs will be superb? All or none of the above? Please advise. As a "reluctant user of the 100-point scale," what would you reluctantly rate 2006, 2007, and 2008 Napa Cabs? If you make an imprecise comment..I guess that it would be aesthetically and intellectually more pleasing to say that the '07 vintage is excellent and, with good grace and provenance,anyone with their eye on the ball will make at the very least supremely drinkable and, at best, classic truly age worthy wines. Saying that a vintage is 96 or 99 points is..sigh..a little fatuous and risks having to make frankly unjustifiable assertions but the wine buying public and a large contingent of the critical press seem to crave that sense of certainty. CWP: I won't, sorry. I didn't set out to do that, and won't for several reasons. Matthews is correct that Laube has tasted a lot more Napa Cabs of those vintages than I have. If he rated the '07s something like 95 points, I would never have questioned him, regardless of what I experienced at a comparative vintage tasting curated by Napa Valley Vintners. I wouldn't think I had the standing. But 99 points is the type of rating that I believe should stand out -- if you blind-taste a dozen Bordeaux side-by-side, the '05s will prevail. Maybe the rating doesn't mean that to Wine Spectator, which is why I asked the follow-up question. Wino: I'm not a fan of the 100-point scale for vintage ratings, because the product being rated is not a single wine but hundreds of wines; to me that calls for less precision. I have been asked to rate wines on the 100-point scale and have done so willingly; it's not hard to give my personal precise ranking of wines. I think if asked to rate vintages on the same scale, I would object. As I just did. "* "We look at the growing season, to estimate potential" -- This is usually important in France, where there's a real chance that grapes in many regions will not get ripe enough to make good wine. It's much less important in California, where sufficient ripening isn't the issue." This is simply not true. California is susceptible to fall rains that can force picks to be made earlier or later than desired (or in some vintages, like 2010, rain can be so severe that the harvest must be completed before they start, no matter whether the grapes are ready to come in or not, effectively shortening the growing season). Heat spikes, frost, and smoke taint are just a few more examples of problems from recent vintages that have wreaked havoc in Northern California. 2007 was unusual in that winemakers were pretty much able to pick whenever they wanted, and that is one of the reasons it has been considered a great vintage by so many winemakers. Anon: I'm afraid you are confusing an easy vintage with a great one. Fair enough, but as you think WS got it wrong, how do you think the vintage should be rated (not on the 100-point scale). Clearly, you do not think that 2007 was not a great growing year that resulted in widespread high-quality wines. My feeling is that customers will drink better NV Cab from 2007 because of all the 50% off sales. They'll perceive a better vintage at their normal price points. However, i'm not seeing 'best wine ever' from NV wines I'll know well. 2017 will tell but my guess says "very good" not "almost perfect." Not in the same class as 2000 Bordeaux or 1998 Rhone where everyone made one of their finest wines in history. Based on weather data from Carneros, Oakville, Angwin (Howell Mountain) and Calistoga (Source: WRCC), 2007 was by no means a warm vintage. From April to August it was a textbook vintage with temperatures and rain volumes nearly identical to the norms. September and October, on the other hand, were significantly cooler than normal, with mean high temps 4 to 5°F below the long term averages. In addition to that, in 10/2007 it rained seven times (5.54 inches) the normal historical volume (0.79 in.) in Carneros; and almost twice (3.74 in.) the NHV (1.98 in.) in Calistoga. "The Picasso was good but not his best work. I didn’t care for the colors but I must say that the frame was very nice ... I would rate it 86 pts"
Greg: I'm not sure what your point is, but movie and music criticism is slowly moving toward the 100-point scale because that's what review aggregators use, and as far as I'm aware there's no backlash or uproar over it. You can't really compare art criticism to wine, music or movie criticism because a Picasso isn't a product that I can personally buy. I also rated Napa 2007 Cabs highly, at 95 points. The wines were luscious and approachable from the get go. What's wrong with that? Yes, maybe 99 is a little too high, but you're being nitpicky here. These high scores, 95-99, are simply a way to telegraph readers that if you buy a 2007 Napa Cabernet and you don't have access to a specific review, you can be pretty sure you're getting an awesome wine. Wine Spectator plays the role of entertainer to the audience. This magazine also enlightens customers about new wine related products available in the market. I am looking at 2007 like 1997. These are beautiful wines for drinking early, I do not think these are wines to cellar. I do not feel that this is a near perfect vintage. This was a good vintage and a vintage where a wine maker would have had to make monumentous mistakes not to produce a drinkable wine. I personally have rarly agreed with Laube on his vintage ratings, for whatever that is worth. Steve: I don't know if you're still reading this, but I'm astounded that you -- ESPECIALLY you -- think I'm nitpicking the difference between a 95 and a 99. Since the lowest anyone goes anymore is 80, that's a 20% difference. But it's more than that psychologically; 95 is excellent, but 99 is near perfect. Do you not take these distinctions seriously? It's like that Spinal Tap bit, 99 (points) is one better than 98. Which in turn is one "better" than 97. That's all it CAN mean. Some here are saying that you are being nitpicky. Some are even more vehement than that. I could not disagree with them more, at least in terms of general sentiment. A '99 point rating for an entire vintage has and will continue to have a substantial commercial impact upon the past/present/future pricing and demand for 2007 Napa Cabs. That rating imparts a "desirability" of the 2007 vintage over most others in a manner connoting that demand should be higher "across the board" for 2007 as it generally has been with 2005 Bordeauxs. Given the crises that the US and Europe have been through during the past 4years, all of which was enabled by easy and overgraded ratings from supposedly independent appraisers who were in fact far too commercially yoked to their subjects, I dont see why folks are so eager to refute your empirical evidence against this particular case of rating inflation. Perhaps their cellars are already stocked to the gills with 2007 Cali cabs and like a French bank holding a boatload of Greek paper, their first instinct is to fight back against your inquiry, as if your inquiry is a per se downgrade of the vintage that they bought into both intellectually and financially as an all time classic.